I saw these bread rolls in Medhaa’s blog long back and bookmarked to try. Now I found a reason to make them today. Yeah, you guessed right! For “MBP: September – Say Cheese” event taking part at Siri’s corner, we have to cook something from other bloggers! So I made these delicious bread rolls for that cheesiest event. I didn’t make any changes to the original recipe. For the filling I used Filling 1 (Mixed Vegetables) as suggested in the recipe. I just omitted cilantro (actually I forgot, he he). I tried the baking version at first, but couldn’t get the rolls perfect. So tried the deep-fried version again and voila! The bread rolls turned out perfect and delicious and irresistible. Thank you for the yummy recipe dear Medhaa! We all enjoyed the rolls so much, so will be making these often. Do visit Medhaa’s blog for many delicious and easy Sindhi recipes. Mix together all the ingredients except oil and bread and keep aside. Remove edges of the bread slices and keep aside. In a plate pour some water or milk, dip each bread slice and gently squeeze out the excess water or milk by pressing the slice with your both palms. Place some portion of the prepared mixed vegetable mixture in the center of each slice and bring the sides together to seal the edges completely and try to make an oval shape. Do the same with rest of the slices. Heat the oil in a deep-bottomed pan and add these prepared bread rolls one by one carefully. Fry the rolls until those turn golden brown in color. Then take the rolls out of the oil and spread on a paper towel to absorb excess oil. These rolls are at their best when eaten hot. Enjoy with ketchup or any chutney. “MBP: September – Say Cheese” event being hosted by dear Siri. MBP (Monthly Blog Patrol) is the brainchild of Coffee of The Spice Café. ½ cup of cheese was used in this recipe which is very rich in calcium and many other nutrients. So the rolls are entering dear Sangeeth’s “Eat Healthy – Calcium Rich” event too. Uma, I am so glad you tried them and liked them too, I too dont like the baked ones much but its healtier so hubby prefers them. Those look nicely puffed up and golden. Never fail deep fried recipe! Mouthwatering and the weather here is perfect for these savory snacks.Uma, lovely saucy mouth! What a lovely recipe, Uma, and your pictures are just gorgeous. 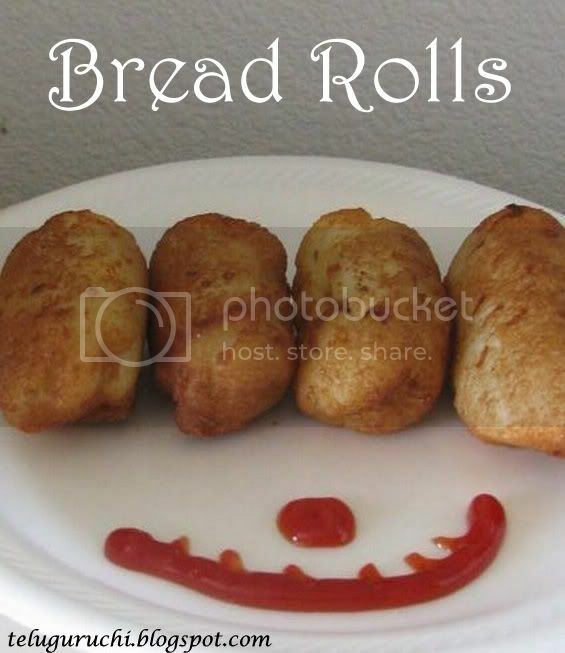 My hubby calls them bomb shell :) we also love this snack and those rolls on plate look perfect! Perfect as an evening snack Uma..
WOW! they look divine Uma..:) Thanks dear. Yummy rolls. Can deep fried ones fail any time? Lovely presentation. Those bite sized bread roll sure making my mouth water!!! Wow! Yummy bread roles Uma! Perfect bread rolls, lovely entry. Look mouth-drooling!!! awesome bread rolls, could you please post step by step recipe for this. Thanks. 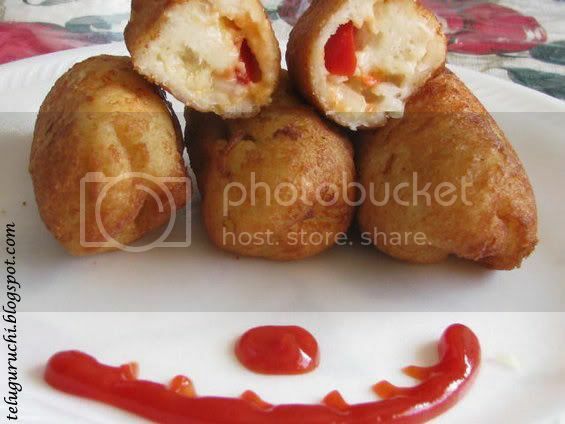 wowwo, the cheesy bread rolls looks yummy. perfect with chai. these looks so crisp and I am just craving to eat this now ..
Can you send these over for breakfast please ? :) looks so yummy..
Uma, I hope you will participate in the Yummy Festival Feast - Diwali event that I have announced this week.. I am so excited at the prospects of having some interesting Deepavali recipes..
Uma, the bread rolls look perfect.. these are served at my house very often and loved each time !! 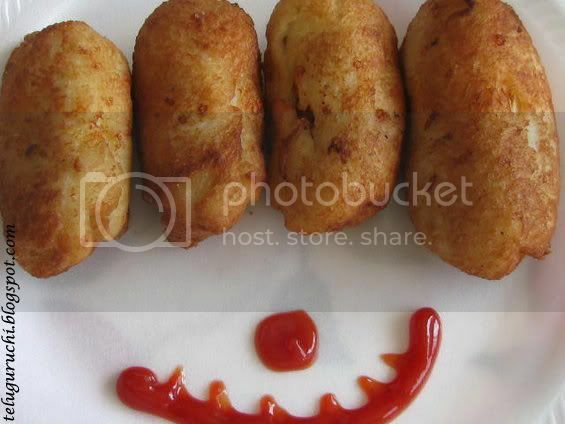 Hi dear....nice to be back.Your blog is looking nice and these bread rolls seem so yummy!! Thanks a ton for the recipe, you are the best!